Coming Soon to Sealed With A Kiss! Summer will be over before you know it–and that means new styles from our designers will begin arriving! Here’s a quick peek at what dresses you can expect to see in store very soon. This is just a small taste of the new looks you can expect to see in store very soon, and we just can’t wait to start getting brides into them! If you’re ready to start your search for the perfect gown, request an appointment through our website: http://sealedwithakissbridal.com/appointment. We can’t wait to help you find the perfect gown. Starting February 1st Sealed With A Kiss Charlottesville and Richmond will be hosting our first trunk show of the year, featuring designs from Anny Lin Bridal. Brides who purchase an Anny Lin design during the trunk show are eligible for a trunk show discount, so this is not an event you want to miss! You can find out more about Anny Lin at annylinbridal.com. Anny Lin comes from family of wedding gown designers, and she has blended designs and techniques that have inspired her to create truly unique, couture designs for the modern bride. Every gown in her collection features an array of carefully designed, eye catching details such as beading, feathers, cut outs and draping. Anny Lin’s designs feature a variety of silhouettes and fabrics. Brides love that she is not afraid to add color to her gowns, so many designs have blush, champagne and ombre options. We also love Anny Lin for their willingness to allow the individual bride to be a part of the design process–they will customize and combine designs to create a one-of-a-kind style to suit the needs and wants of the bride. Be sure to schedule your appointment for the Anny Lin Trunk Show soon! You will not want to miss out on a chance to see these gorgeous dresses. Here at Sealed With A Kiss we specialize in customizing a bride’s wedding day look to suit her individual style. Sometimes that means working closely with our designers to combine or create pattern changes on a design, but most of the time our owner-designer Susan and our expert tailoring team do the customizations right here in our store. Here’s a closer look at some of the easy ways you can use alterations to customize your wedding gown. Our bride Rachel found a beautiful lace style she loved, but after she bought the dress she thought the illusion neckline was a bit too much–so we redesigned it! Rachel was much happier with the regular sweetheart neckline and beaded straps. Our bride Sarah loved an all over silk gown from Justin Alexander, but said she would love it more if it had a lace top–so we made her dreams come true! Our owner Susan worked with Sarah to design an off the shoulder lace jacket that she can take on and off on her wedding day as she pleases. The jacket gives the gown a totally different look, and it was exactly what Sarah was looking for. Bride Judy fell in love with the fitted gown on the left, but had originally wanted a shorter dress so that it would be easy to dance all night at her reception–so we converted the skirt into a high-low design! Bride Kelli absolutely adored this gown from Justin Alexander, but didn’t want a gown with a high neckline–so our tailoring team created this gorgeous v-neckline for her! Kelli loved how her gown turned out. Alterations open up an array of possibilities for customizing your gown, so feel free to ask your stylist or seamstress about altering areas you want changed. We guarantee you’ll be ecstatic with the end result! When we first ask a bride about what wedding gown styles she’s interested in, often the answer is “I want something with a beautiful back design!”. Since we love pretty details on the back too, we’ve put together this list of gowns by designers we carry that are all about that back. Whether you prefer lacy illusion or a beaded back, you’re sure to find a gown you love on this list! This 1920’s inspired design has a stunning deep illusion back covered with a gorgeous beaded lace. Brides love how glamorous they look when they try this style on! 2. This modern take on a classic fit and flare shape has one of the most stunning backs we’ve ever seen! The way the lace frames the deep illusion back makes for a different but flattering shape, and the buttons are the perfect finishing touch. 3. This design features a daringly low illusion back with lace applique details–it’s sure to wow your guests as you stand at the alter! 4. This mermaid gown features all-over pearls, crystals and sequins in a floral inspired design. The beaded back design makes this gown a stunner! 5. Brides are sure to fall in love with the open illusion back on this gown! The embroidered design is sure to turn heads, and the jewel neckline adds a touch of elegance to the look. 6. This elegant fitted design features an ultra-low open back! We love the beaded detail on the v-neck front as well. 7. Many strapless wedding gowns have gorgeous back design details as well, like this fit and flare design! It features a low scoop illusion with lace appliques. 8. This fitted gown has a back with sheer French tulle and intricate lace detail! We also love that this couture gown has all over French alencon lace. Ask Pat: Why is saying yes to the dress so hard? Pat: I’ve been shopping for a wedding gown for about two months now, and I just can’t seem to commit to one. At the very first shop I went to I found a dress I thought was “the one,” but didn’t want to say yes to a dress at the first store I visited–I felt like I needed to see what else was out there. Since then I have found two more dresses I really love, but I just haven’t had one of those bridal moments where I put on the dress and just know that this is the perfect one. Will I ever have one of those moments? I know I could probably be happy enough with one of the three dresses I’ve found, but how am I supposed to know which one to choose if I don’t feel more special in one than the other? What if the perfect dress is still out there and I just need to find it? It sounds like you’re feeling overwhelmed! That tends to happen after you’ve visited a lot of bridal boutiques, and my best advice is to stop looking at new dresses. The more dresses you try on the more confused you will become, and the more you’ll begin to doubt yourself. This will just make deciding on a gown even more difficult. I know many brides expect to have that moment where they slip into a dress and realize it’s “the one”–it’s a moment dramatized over and over again in movies and in shows like Say Yes to The Dress. The fact is, however, that not every bride is going to have this moment, and that’s okay! Every bride is different, so we shouldn’t expect every bride’s wedding gown shopping experience to be exactly the same. That being said, if you’re not the type of bride who will have that moment of realization when you’ve found the perfect dress, it can be a little harder to determine which dress is “the one.” As in your case, you might end up visiting several bridal shops and finding several gowns you love. When this happens, and when you begin to feel stressed by the shopping experience, it’s time to stop trying on new styles. Instead, think about the options you’ve already found. Try to remember how you felt in each dress. Does one stand out in your memory? Was there one you really could imagine yourself walking down the aisle in? If you can’t remember the gowns well enough, try booking appointments to re-try on each of the dresses you have in mind (and just those dresses!). It’s best to do this alone or with just one family member or close friend who you know will be supportive. Trying on the favorites back to back should make it easier to discern which of the gowns you truly love best. Often the feelings you had about each gown will return when you see yourself in it again–or you might find you don’t feel the same about the dress at all during this second look.Be sure to try on each gown with veils and accessories so that you can visualize the full look you’ll have on the big day. In the end, go with your gut. You likely know which dress is “the one,” but aren’t trusting yourself to make the decision for one reason or another. Take a deep breath, get the insecurities out of your mind, and choose whatever makes you happy. No matter what you choose, you will look and feel beautiful on your wedding day. Augusta Jones Bridal Trunk Show this September! This September is the perfect time to fall in love with a design by Augusta Jones Bridal. Sealed With A Kiss will be hosting Augusta Jones Bridal Trunk Shows in both Charlottesville and Richmond. 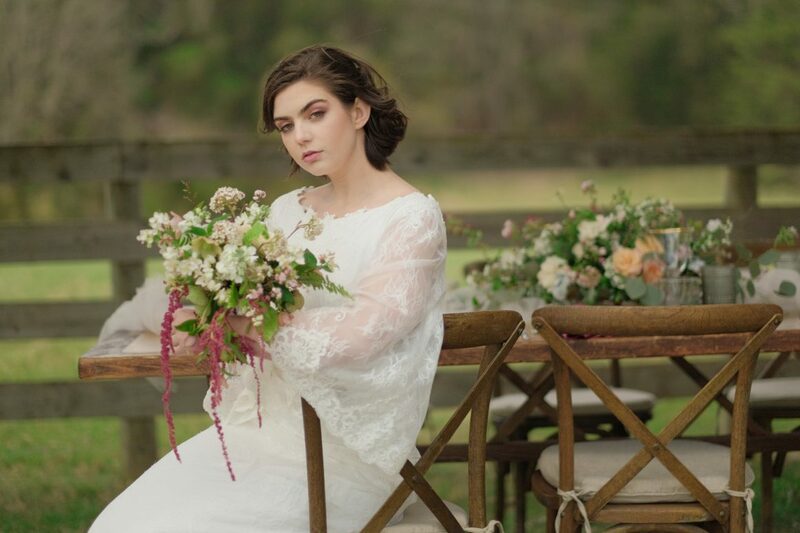 During this time we will have designs by Augusta Jones not typically in our store, and brides who say yes to an Augusta Jones dress will receive a 10% trunk show discount. Sealed With A Kiss Richmond Trunk Show Dates: September 9th-13th. Call 804-393-2041 for appointments. Sealed With A Kiss Charlottesville Trunk Show Dates: September 14th-17th. Call 434-979-5683 for appointments. Classic gowns for the modern bride–that is what Augusta Jones Bridal stands for. When you browse their collection you’ll find shapes and silhouettes you’re familiar with–form fitting mermaid gowns, figure flattering a-lines and shop-stopping ballgowns. But what sets Augusta Jones apart is there clever design work and attention to detail. All Augusta Jones Bridal dresses are made ‘bespoke,’ which means that brides can easily customize the gown to better suit their personal styles–from changing necklines to switching out fabrics, the options for customizing their gowns are endless. Besides the innovative designs, Augusta Jones focuses on selecting only the highest quality laces and fabrics for their gowns. Brides feel luxurious and beautiful every time they slip into an Augusta Jones gown. It’s no wonder so many brides choose to wear an Augusta Jones gown on their wedding day. Our Sealed With A Kiss bride Maitland married the love her life Austin on November 14, 2015 at Christ Episcopal Church here in Charlottesville. Before Maitland came to see us during her search for a wedding gown, she had come across this silk ball gown with a beaded neckline online, and it was love at first sight. When she came in for her appointment she showed us a picture of this gown and said she was looking for something similar–turns out, we had that very Justin Alexander Signature dress here in our store. She said yes to the dress that afternoon. Maitland and Austin’s ceremony was followed by a reception at Farmington Country Club, where friends and family couldn’t wait to start celebrating. We know these two have many happy years to look forward to. Congratulations again Maitland and Austin! Dress: Sealed With A Kiss, Photographer: Wendell Powell Studio, Hair and Makeup: Salon Cielo, Flowers: Marion’s Flowers, Band: Sam Hill Entertainment’s Attraction, Bus: Blue Ridge Tours. Brides are often surprised by how many different necklines they encounter while wedding gown shopping, so we’ve put together this list of popular neckline styles to help you find the cut you like best! Sweetheart necklines are one of the most popular necklines, and for good reason! Named for their resemblance to the curves at the top of a traditional heart shape, this neckline is universally flattering. While most brides associate sweetheart necklines with strapless gowns, you can certainly find sweetheart necklines on gowns with sleeves and straps. V-necklines are also popular on wedding gowns! Brides love the cut, and many choose to customize their gown by lowering or raising the neckline. There are many variations of the Queen Anne neckline, but they all have one thing in common: a raised back. The style has always been a classic, but has been recently popularized by the wedding gown worn by the Duchess Katherine of Cambridge. Brides who prefer having a little more coverage up top will love the look. Jewel necklines are round and closely follow the neck. Jewel necklines tend to give wedding gowns a modern and sleek look that brides love! Portrait necklines are so named because they are styles that frame the collarbone, much like a portrait. These necklines have sleeves that rest on the tip of the shoulder blade, providing a variation of the off-the shoulder look. The scoop necklines are another popular neckline on wedding gowns! Their wide rounded shape shows off the collarbone and is another universally flattering shape. Ask Pat: Who should I bring to my bridal appointment? Dear Pat: I scheduled my first bridal appointment, and I would like for my parents, grandmother, soon to be mother in law and my bridesmaids (4 of them!) to be there, but that seems like a lot of people! Who do brides usually bring to their bridal appointment? Should I try to narrow down the number of people I’m bringing? I know it’s tempting to invite as many family members and friends to your appointment as possible, but more people means more opinions and that has the potential to make bridal shopping stressful–especially during the first bridal appointment! I usually advise brides to think about three or four people who are supportive and whose opinions will matter the most–those are the ones you want with you when you’re trying on wedding gowns for the first time. Most of our brides will come in with one or both parents and a friend. If you feel you need to include other family members or friends in the gown process, consider scheduling a second appointment to show them just your top choices, or have them accompany you to your fittings after your dress comes in. Wedding Style Inspiration- Hair Accessories! Not sure what hair accessory will complement your wedding day style? Then look no further, Sealed With A Kiss has got you covered! Look through some of our favorite headbands, combs and tiaras and you’re sure to find one that works well with your style. Want a hair piece that is truly going to make a statement? Then this headband may be perfect for you! It features delicate hand beading, sweeping crystals and hand made floral designs. 2. Perhaps you’re planning on having your hair styled into a pretty updo and want a small piece that will accent your chignon? Then this elegant hair vine barrette may be the perfect accessory for you! It has strands of crystal, freshwater pearls and rhinestones. This piece is made flexible to add versatility to how it’s placed in your hair. 3. Perhaps your style is a little off-beat chic? Then you’ll love this dramatic hair ribbon with matte crystal and beautifully draped stones. 4. This side tiara with silver beaded applique is perfect for the bride who wants add a touch of vintage glam to her wedding day look. The headband is ideal for brides wearing their hair down on their wedding day. 5. If a boldly beaded headpiece isn’t for you, try this pearl and crystal halo! This delicate piece adds a touch of romance to your wedding day look. 6. For brides looking to channel their inner queen, this tiara is ideal! It features extra sparkly silver crystals, and is a true statement piece! 7. Maybe gold pieces are more your style? If so, this five piece gilt foliage pin set is sure to complement your look beautifully! It features delicate tendrils of crystals and freshwater pearls.